Mark the time four different ways with this unique design by Daniel Will-Harris. The time? Oh, it's half past Scorpio. If that doesn't make sense, you're probably not wearing this unique watch by designer Daniel Will-Harris. Along with good old Arabic numbers (1, 2, 3), it also has Roman and Hebrew numerals, and the 12 Zodiac symbols as hour markers. Daniel added hands that frame each wedge of symbols, so you'll always know when it's VIII o'clock. 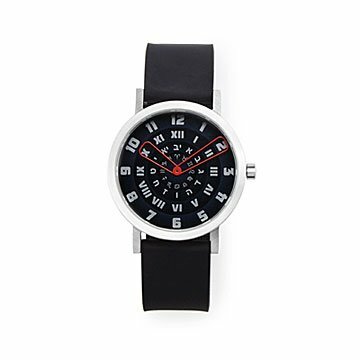 With its classic black silicone band, it makes a great gift for math geeks and design lovers. Made in China.